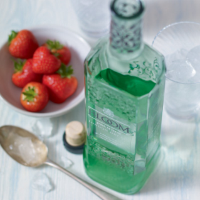 Inspired by the English country garden, the subtle sweetness of both strawberry and honeysuckle notes from Bloom gin provide a soft foundation complemented by the light and alternative citrus note of pomelo. When tonic water is added, the quinine subtly heightens this flavour for an interesting alternative to a classic G&T..
1. Pour the gin into an iced-filled tall glass, top with tonic water and lightly stir. 2. Ser ved garnished with the sliced strawberries.